Plants on wheels? The Exaco Calypso Planter with Trellis allows you to move climbing plants from place to place, whether to optimize their sun and rain intake, partition your outdoor space, or create mobile shade for other plants, people, or pets. Locking wheels prevent your plants from cruising without permission. Built in Germany, this planter features a built-in reservoir, double bottom, and water level indicator to simplify maintenance of optimal soil moisture. The built-in reservoir holds 2.5 gallons. This box planter is designed not to leak, so you can also use it indoors with confidence. A durable, 4.5 foot high polyethylene trellis accommodates aggressive climbers. Option to choose from 3 colors: white, green, or grey. Exaco USA Ltd. is a family-owned company based in Austin, Texas, that introduced the Exomixer paint mixing blade to the U.S. market in the late 1980s. The company has been a vendor to major home center chains and national distributors for 17 years, providing a variety of innovative products for your yard and outdoor living. 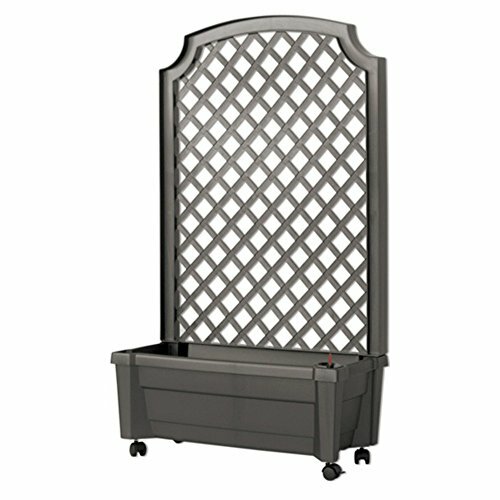 Trellis planter on wheels for indoors and out. Built-in 2.5 gallon water reservoir. Moisture indicator and double bottom. 2 locking wheels. Option to choose from 3 colors. Made in Germany. Dimensions: 31W x 13.5D x 53H in.. If you have any questions about this product by Exaco, contact us by completing and submitting the form below. If you are looking for a specif part number, please include it with your message.